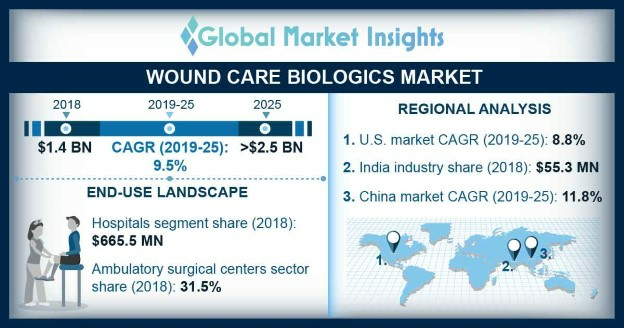 Wound Care Biologics Market size is set to exceed USD 2.5 billion By 2025; according to a new research report by Global Market Insights. Increasing geriatric population globally will surge demand for wound care biologics as the elderly population base is susceptible to chronic infections. According to World Ageing Population, in 2017, 962 million people were in the age group of 60 years and above. Majority of the geriatric population suffers from chronic ailments. For instance, prevalence of foot ulcers is specifically high due to diabetes and other endocrine diseases in elderly people that will boost the demand for wound care biologic products such as skin substitutes and growth factors. Skin substitutes are highly preferred as they increase the chances of survival and helps in sustaining patient’s life. Thus, high adoption of such superior quality wound care biologics in treating the geriatric population will augment the industry growth. Rising government initiatives to increase availability of wound care treatment in developed countries will significantly propel the industry growth during the forecast period. Government in developed countries proactively undertake several initiatives such as planning programs to raise the awareness levels amongst the people suffering from burn and other chronic injuries. The government specifically focuses on providing cost-effective quality wound care products that raises its adoption amongst the physicians and doctors. The wound care biologic products are expensive. Therefore, recently government in developing countries such as India have also started focusing on making the wound care treatment affordable that will prove beneficial for the industry growth. However, lack of trained physicians in underdeveloped countries will hamper the wound care biologics market growth up to some extent. Skin substitutes segment was valued at USD 940.6 million in 2018 and is expected to have considerable revenue size during the forecast timeframe. With advancements in research and technology, availability of superior quality skin substitutes has escalated that will positively impact the segmental growth. High usage of biotechnologically engineered skin substitutes for aesthetic surgeries and skin reconstruction surgeries in burn cases will further augment segmental growth. Burns segment will experience 9% CAGR during the forecast timeframe. Considerable segmental growth is attributed to increasing prevalence of skin burns and consequent surge in the demand of wound care biologics products. Skin burns require critical care and the wound dressings need to be changed at appropriate time intervals to avoid future complications. Increasing preference for wound care biologics in treating skin burns will augment the segmental growth during upcoming years. Hospitals segment accounted for 45.9% in 2018 owing to extensive use of wound care biologics products in treatment of surgical wounds. Also, high adoption of skin allografts in skin reconstruction surgeries will augment the business growth in forthcoming years. Moreover, hospitals covered under public sector in developed countries are well-equipped with technologically advanced devices and wound care products that will surge the segment growth. China wound care biologics market witnessed 11.8% CAGR and is anticipated to grow exponentially over forecast timeframe. Increasing prevalence of diabetic foot ulcers in China will enhance the industry growth. Moreover, Chinese population has high preference for aesthetic surgeries that proves beneficial for the industry growth. Furthermore, availability of superior quality wound care biologics in China will positively impact the Chinese wound care biologics market growth.